Oakland teachers ended their seven-day strike on Friday, walking away with an 11 percent raise for educators living in one the most expensive areas in the U.S.
Add Education as an interest to stay up to date on the latest Education news, video, and analysis from ABC News. The Oakland Education Association and the Oakland Unified School District [OUSD] announced that the agreement would also limited class sizes and put a halt on charter schools. "This is a historic contract with a win in every major proposal we made, that moves us toward a win for the schools Oakland students deserve!" the teachers' union wrote in a statement announcing the deal. "We FORCED Oakland Unified School District to invest in keeping teachers in Oakland – which will give our kids experienced teachers in their classrooms." Likewise, in a press release from school district, Superintendent Kyla Johnson-Trammell praised the agreement. California Sen. Kamala Harris, a 2020 presidential candidate who has been outspoken in her support for the Oakland teachers, called the deal an "important victory for teachers, students, and unions -- proving the power is always with the people." Prior to the strike -- which kept 97 percent of students out school -- the union and the school district failed to produce an agreement after two years of negotiations. After 95 percent of Oakland public school teachers walked out for a week, marking the first time educators went on strike in 23 years. Oakland Unified School District students and teachers carry signs as they picket outside Oakland Technical High School on Feb. 1, 2019, in Oakland, Calif. 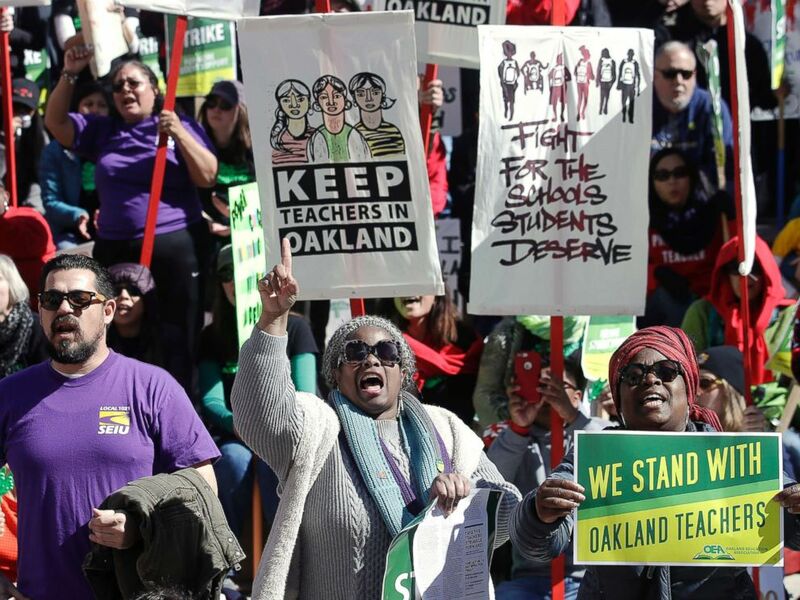 The deal for Oakland's educators is the latest of several strikes by teachers across major U.S.cities. Teachers and students whose parents kept them home to support the strike will return to school on Monday. Schools had been open and operating with a skeleton crew of substitute teachers. The end of the Oakland strike marks the most recent resolution to walkouts between teachers and school districts, starting in West Virgnia and including Los Angeles and Denver. The agreement still needs to be ratified, after which the teachers will receive a 3 percent bonus, according to the union's statement. The 11 percent pay bump will be spread over four years. 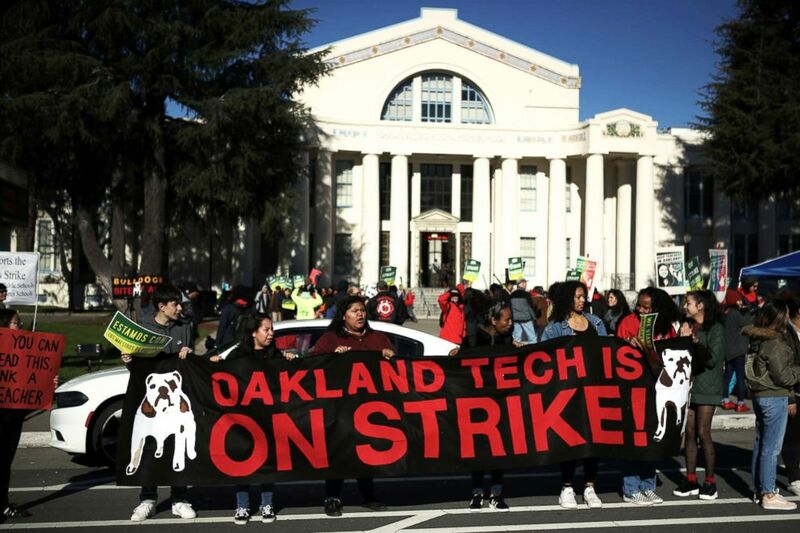 Like in Los Angeles, where teachers went on strike in January to protest large class sizes and a lack of resources, such as counselors, nurses and psychologists, Oakland teachers ended the strike with promises of more support personnel. Oakland high schools will reduce classes by one student next year, followed by another one-student reduction in 2021-2022 school year. Teachers, students and supporters rally at Frank Ogawa Plaza in front of City Hall in Oakland, Calif., Feb. 21, 2019. Oakland is also similar to Los Angeles, which faces a drastic wealth disparity between highly paid tech and entertainment industry workers which has squeezed residents with middle class jobs and given rise to an increase in homelessness. The Oakland teachers also won a concession from the school board to introduce a resolution calling for a charter school moratorium, similar to the one introduced by LA schools.